Q. What is water system flushing? A. Water system flushing (also known as hydrant flushing) is a routine maintenance process that involves the systematic ‘flushing’ of the water distribution lines to remove sediment and improve water quality. When flushing, fire hydrants are opened, increasing the velocity of the water moving through the pipes. This process cleans the pipes and removes the sediments that can affect the taste and color of our drinking water. Q. Why is flushing needed? A. Flushing is a routine maintenance process that removes sediment and improves water quality. Without regular flushing, sediment can build up in the pipes and affect the quality, taste and color of our drinking water. Q. What areas of Fort Collins are being flushed this year? A. Crews will start on Mason Street and move eastward to Northern Lights Drive (just past Ziegler Road), with Willox Lane as the northern boundary and Rock Creek Drive (south of Harmony Road) as the approximate southern boundary. Q. When will crews be flushing in my neighborhood? A. View our online map for current locations, call 970-212-2900 or V/TDD 711 for details. Q. How long does the flushing process last? A. Crews will begin flushing the water system in early April, typically working from 7 a.m. to 5 p.m., Monday through Friday, for approximately eight weeks. When flushing Downtown, crews will begin at 5 a.m. in order to be out of the area as quickly as possible. Q. Where does the water go? A. After the water is de-chlorinated, it is discharged into the storm drainage system which eventually leads into the Poudre River. Q. Approximately how much water is used during the flushing process? A. During the annual flushing process, an average of 20-25 million gallons of water is discharged (typically ranging from .5 to 1.5 million gallons/day). This is about 0.35 percent of Fort Collins’ annual water use, or approximately one day's water use. A. While this is sometimes an option, we currently are not able to transport and/or store the overall volume of water that is needed to flush our distribution system. Fortunately, the water used for flushing accounts for a small portion, approximately 0.35 percent, of Fort Collins’ total annual water use, which is equivalent to about one day’s water use. We make every effort to conserve water where possible and utilize this option when there is an immediate need for water within the city. To provide more background, a large tanker truck has a capacity of approximately 9,000 gallons and typically can make six to eight trips per day. For comparison, the flushing program uses between .5 to 1.5 million gallons daily to sufficiently cleanse the system. The City does not have any ground storage tanks that the water could be stored in for later use as irrigation water—and, in most cases, this water is removing sediment from the system, making it unsuitable for filling drinking water tanks. Q. How will my water service be affected? A. The flushing process doesn't typically interrupt water service, but it can happen on occasion. A loss of water pressure is more common. Your water also may appear cloudy or discolored for a short time. This water is not harmful, though it may stain laundry. Q. What should I do if my water is cloudy or discolored? If you notice improvements, continue running the cold water for a few more minutes or until it is clear. If it is not improving, turn off the water, wait 30 minutes and repeat. If it still doesn’t clear, you can call 970-221-6700 to report your concerns. Another option is to run the garden hose, weather permitting, until the water clears. Cloudy: Water gets cloudy when air gets in and makes tiny bubbles. These bubbles are harmless and will disappear if you let the water sit for a few minutes. Discolored: Sediments in the water lines get stirred up and may cause a slight water discoloration for a short time. This water is not harmful, though it may stain laundry. Q. Can I use my water while crews are flushing in my neighborhood? A. Please minimize water use while crews are in your neighborhood. To avoid the risk of drawing sediments into your hot water tank, do not use any hot water. Avoid doing laundry during this time as the sediments in the water may cause stains. Q. Is my water safe to drink? A. Yes. The sediments that get stirred up may not be aesthetically pleasing and can cause the water to discolor and stain laundry, but they are not harmful. Q. What should I do if the water stains my laundry? A. Before drying, rewash the clothes when both the cold and hot water are clear. Non-chlorine bleach (such as Clorox II) may be used to help remove the stains. Do not use chlorine bleach. Q. Are there other benefits to water system flushing? A. Flushing is an essential preventative maintenance strategy for our water system and also provides an opportunity to inspect the fire hydrants for operation and safety. A. For additional information, please contact Water Utility Field Operations Supervisor Jim Carder at 970-416-2165 or amNhcmRlckBmY2dvdi5jb20=. 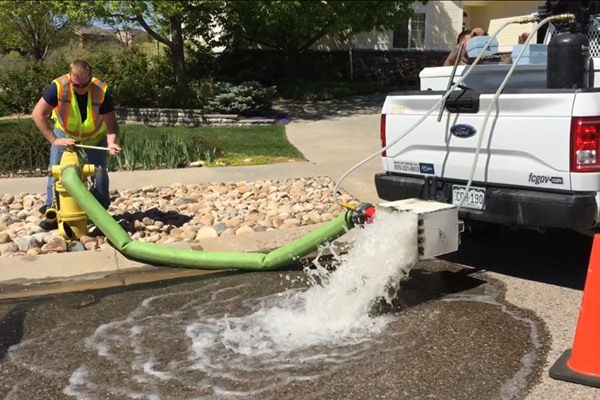 Fort Collins Utilities flushes the water distribution system in early April for approximately eight weeks, weather permitting, weekdays, 7 a.m. to 5 p.m.
Flushing helps maintain water quality and keeps our water fresh. It's a proactive and essential component of our preventive maintenance program and allows crews to assess the condition of the distribution system and fire hydrants during the process. Crews will start on Mason Street and move eastward to Northern Lights Drive (just past Ziegler Road), with Willox Lane as the northern boundary and Rock Creek Drive (south of Harmony Road) as the approximate southern boundary. When flushing, fire hydrants are opened, increasing the velocity of water moving through the pipes and removing sediments that may affect the water's taste and color. While a loss of water pressure is common, the process doesn't typically interrupt water service. See how water distribution system flushing works. If you notice improvements, continue running the cold water for a few more minutes or until it is clear. If it is not improving, turn off the water, wait 30 minutes and repeat. If it still doesn’t clear, you can call 970-221-6700 to report your concerns. See FAQs for more detail on why water is cloudy/discolored and best practices for getting it to clear.